Dine or treat yourself at the Culver’s of Lake Hallie on Tuesday, April 23rd between 10:00 a.m. – 10:00 p.m. and Culver’s will donate 10% of the sales to the Chippewa County 4-H Educational Experiences! Enjoy a delicious meal, benefit a great cause and feel good all over! Please print the attached flyer and present it to the cashier to let them know you are there to support 4-H! Open Pleasure Schooling Show at the Northern Wisconsin State Fairgrounds on May 11, 2019. This is a 4-H sponsored event; therefore, all riders must wear a SEI approved helmet. Show begins at 9:00 a.m. Rain or shine. For additional information click here. A unique trip experience designed just for 5-8th grade 4-H students to help build leadership skills and experience teamwork. Youth will depart Chippewa County on Tuesday, June 11th at 2:00 p.m. for Dane County and return on Thursday, June 13th around 8:00 p.m. to Chippewa County. During this adventure, youth will provide community service at a food pantry garden, experience some of Madison culture, visit the WI museums, picnic with Dane Country 4-H’ers, visit Babcock Dairy, visit Devil’s Lake State Park and spend a day at Noah’s Ark and more! Registration fee includes lodging, meals, transportation and activity fees. For additional information and registration, please click here. This hands-on workshop was held on Saturday, February 16, 2019. The workshop helped youth learn how to take apart and put back together a small engine. Youth were encouraged to take pictures during the day and put together a poster on what they leaned for the fair! 4-H Youth and Adults joined Samantha Willi, 4-H Adult Volunteer, on Sunday, April 7th at the Elk Creek Lutheran Church for a DIY Stencil Chalk Project. Samantha had several stencils on hand for guests to choose from. Various backgrounds were available as well. Those in attendance learned how to do stencil chalk and left with some gorgeous projects to show at the fair! The Tri-County Arts & Crafts, Photography and Drama Festival was hosted by Dunn County 4-H this year on Saturday, March 9th at the Menomonie Middle School. This festival was open to all 4-H members from Chippewa, Dunn and Eau Claire County. Be sure to check out the April newsletter for festival results. 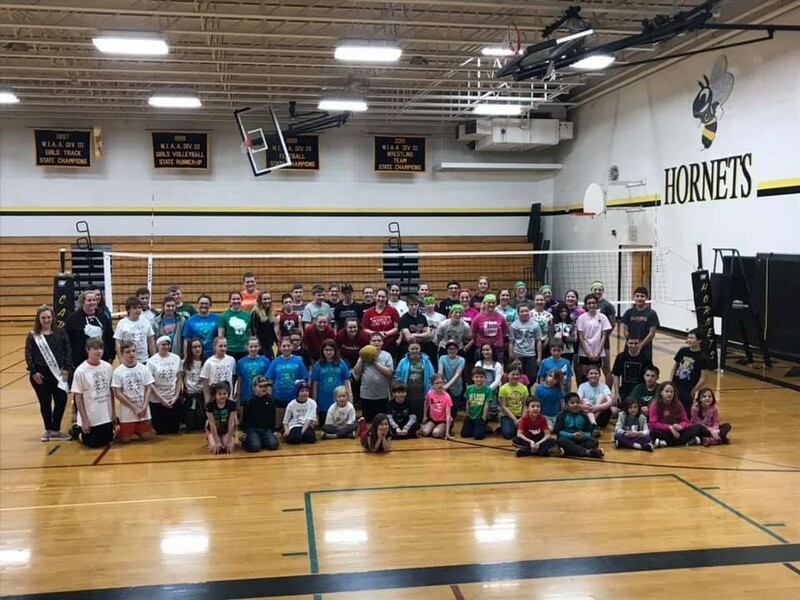 Chippewa County youth in grades K-5th grade were encouraged to participate in the Spring Kickball Tournament on Sunday, March 24th at the Cadott High School. The tournament was open to 4-H members only in grades K-5. 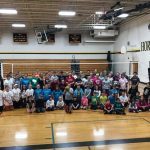 Teen Volleyball Tournament is held each Spring at the Cadott High School. Participating clubs play each other in one of two brackets (fun or competitive). See the April newsletter for bracket placings. The 2019 Tournament was held Sunday, March 24th at the Cadott High School. This tournament is open to 4-H members only in grades 6-13. Click here to see the results for the 2019 tournament. We will be having a LEGO Mindstorm Introduction Class starting Tuesday, April 2, 2019. This class will be held every Tuesday, running from 6:00 p.m. until 7:30 p.m. for a period of 5 weeks, in Room 3 of the Chippewa County courthouse. This class will cover the building and basic commands of the EV3 robot. This class is for 5th-12th grade and is limited to a total of 8 youth. Parents are welcome to take part and help their youth, plus if there are open computers, you can do your own! The class will be challenging! Basic computer knowledge is helpful, but not necessary. For more information and to get signed up, contact Scott Hansen. Registration and contact information can be found here. Clover University is a spin-off of the ever popular Clover College! This 5-hour event was held on Saturday, April 6th at the Chippewa Falls Middle School. This event is open to 4-H and non 4-H youth in grades 6-13. Sessions at Clover University provide youth with a higher level of learning in each project area. Youth need to pre-register for sessions. We are excited to introduce this event in 2019 to our upper grade youth for an in-depth engagement in particular project areas. 4-H rabbit project members were encouraged to attend the Saturday, April 6, 2019 rabbit learning clinic. The clinic was held at the Howard Town Hall from 9:00 a.m. – 3:00 p.m. The clinic was free. Lunch was available with proceeds benefitting the Chippewa County 4-H Rabbit Project Fund. Youth learned about how to pick a rabbit, feeding your rabbit, grooming and caring, etc. 4-H Summer Camp (Overnight & Day) is held in July at Kamp Kenwood. Overnight camp is open to youth completing 3-8 grade. Day Camp is open to youth in grades K-3. 4-H Camp offers an excellent opportunity for youth to make new friends, learn new camping skills, and enjoy the outdoors. Youth do not need to be a 4-H member to attend. Area Animal Science Days, formally known as the District Dairy and Livestock Days, were started with the intention of giving as many young people as possible an opportunity to learn more about livestock and dairy evaluation. This event evolved into Area Animal Science Days to broaden the scope of members enrolled in the 4-H Animal Science Projects. These days are focused on the learning experience rather than the contests. The Chippewa County Farm/Tractor and Machinery Safety Program will be held June 2019 at participating area schools. The purpose of the program is to teach youth about tractor, machinery and farm safety. Upon successful completion the student will receive certification in both the State and Federal Tractor and Machinery Programs. The safety program is directed toward youth who are 12-16 years of age. This training is available to all youth, you do not need to be a member of 4-H or FFA. Registration and information regarding the training will be available in April 2019. The annual Houseplant Workshop was held in January at Christensen Floral in Chippewa Falls. This event was for any 4-H member interested in learning more about houseplants and planting their own plants to nurture. The cost of this workshop included a 10″ plastic pot, vermiculite, potting soil and 14 plant cuttings. A representative from Christensen Floral lead our workshop and provided helpful tips on planting and maintaining your houseplants. Pre-registration was required. Parents and leaders were also welcome to participate in the workshop with paid registration. The Tri-County Speaking, Demonstration and Music Festival was hosted on Saturday, January 12th at the Augusta Community Center in Augusta. Eau Claire County was our 2019 host. The festival was open to all 4-H members from Chippewa, Dunn and Eau Claire County. Festival results can be found here. Clover College is a 3-hour event held each January at the Chippewa Falls Middle School. This event is open to 4-H and non 4-H youth in grades K-6. Clover College provides a variety of sessions for youth to choose from to learn and experiment. The 2019 event was held on Saturday, January 19, 2019. Youth pre-registered for sessions which included various 4-H project related learning’s. Thank you to everyone who joined us this year and we are underway for planning the 2020 event! This year contest is held in conjunction with the Clover College event. Safety in our homes and at work sites is very important in preventing accidents and injuries. Members are encouraged to take time and put thought and pride into their poster/essay/video entries. This is a great opportunity for the youth to express their thoughts on a safety issue. Contest results are then displayed through the month of February at our event co-sponsor Eagle Point Mutual Insurance in downtown Chippewa Falls. Contest information for 2020 will be available later this year. Two leathercraft workshops were offered this winter on Saturday, January 5 and Saturday, January 26, 2019. Chippewa County 4-H Youth participate in two workshops geared for all skill levels; those who want to learn about leathercrafting and those who would like to continue to perfect their crafting skills. Participants are encouraged to attend both sessions, if possible, but not required. This will allows time to prepare and stamp their item on their first visit, then on their second visit, they have the opportunity to add color and seal their item(s). If youth are an advanced leathercrafter, they are encouraged to bring along a project they are already working on, if they have one or if they have a project to start that they have purchased, bring that along too. The Foods Revue event was held on Saturday, April 13 at the Lake Hallie Village Hall. Participants provided their best dish for judges and fellow competitors to taste. Results of the event will be highlighted in the Chippewa Chatter newsletter following the event. A recipe book of all the entries is available each year in the 4-H Youth Building at the Northern Wisconsin State Fair and on this website under the projects tab. This event is open to 4-H Youth only. The Clothing Revue event was held on Saturday, April 13 at the Lake Hallie Village Hall. Participants presented their clothing construction items and/or their Buymanship articles. Participation was limited to 4-H youth or organized group youth members. Construction items were judged on suitability of garment to individual and purpose as to color and design, general appearance – neatness, posture, and fit, construction tot he extent that is affects general appearance, and suitability of accessories. Looking Good entries were judged on suitability of garment and accessories, general appearance, value and knowledge of selection factors.